I went to the Blue House, and it was 3:40 when I arrived in front of the Blue House. Asked about the famous Nok Ji Won mentioned by President Moo-Hyun Roh, and says it is far inside. The reply is evasive. This person is one of the two who were nearby that I saw when I arrived there. Of course later on many people circled around and asked many questions without revealing their names. This person said, only you would be disadvantaged, and what does it mean? Can’t I protest? Even in Brussels, after the attempt to kidnap and assassinate failed, the intelligence agent communicated like that. And then there were a series of bioterrorism and attempts to kidnap and assassinate. There was conspiracy and threat from a self-styled patriot that I could not understand. Chief of NIS Kuhn Shin called himself just an errand man. All the authorities were the kinds of people who have enough experiences to know there are different kinds of errands. 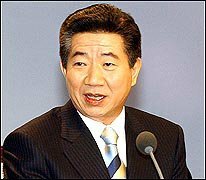 Wanting a civil petition about what an ambassador of the Vice Minister rank did abroad for the NIS Chief Kuhn Shin who runs errands! Knowing the attempt by an ambassador of the Vice Minister rank and NIS! Is the Blue House qualified to talk about civil petition when it responds with biological agent using terror to an email sent to President Dae-Jung Kim? When I tried to turn around and come out around 4:40, a young agent showed temper and told me to wait. What is the box that you have, he said in an irritated way, so I gave it to him and told him to open it, but he asked again, so I just took it back from his hand. He showed irritated attitude and language even when I was leaving. In the past, in Brussels, Kaleb Kim came to my residence with such an attitude, getting loud with the story they had made up and got ill tempered. Of course it was a kind of trick to conceal his true identity. It was an intentional threatening and conspiracy. I saw another person who enjoyed playing word game to threaten. PS: I already said inside the room that I might go to the Blue House. The person who talked to me at arrival was the person who accompanied me when I was leaving for the last time. It was a well prepared proceeding. As time passed, the number of people who approached saying this and that around me increased, and in the end before I left they even smiled among themselves. They show their true nature when they show smiles that are not smiles to the victim of political oppression. From now on, I have to pay attention to those who go to the back side even in front of the Blue House. Disadvantage! You have generated a lot of interest in your blog. It does contain a great deal of information and discussion. If you have some spare time, do feel free to visite the following domain name site as it offers much of all the domain name related services. You have generated a lot of interest in your blog. It contains a great deal of discussion. Feel free to surf these sites domain name r, reseller, register domain, cheap hosting, and internet guide! You have generated a lot of interest in your blog. It contains a great deal of discussion. Feel free to surf the following sites domain name hosting, domain name, domain reseller, au domain and free website! You have generated a lot of interest in your blog. It contains a great deal of discussion. Feel free to surf the following sites cheap domain, domain name, domain reseller, au domain and free website! Presidential Security Service (PSS)? / Service de Sécurité Présidentiel? President Moo-hyun Roh's "Back to Life"